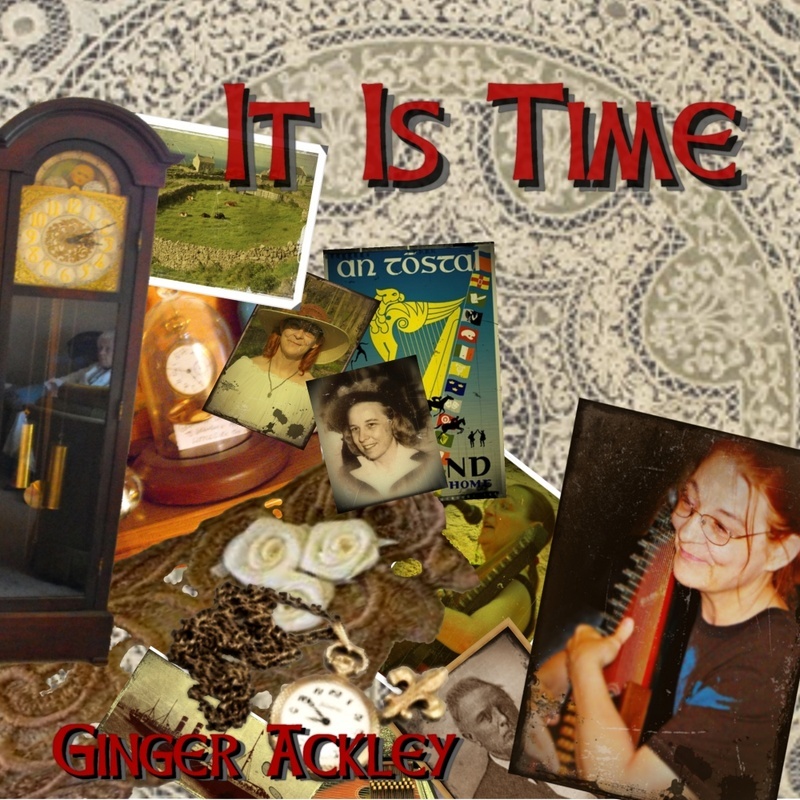 With 15 songs, including 2 traditionals, "It Is Time" brings a collection of Ginger's Folk and Celtic music to all her friends, old and new! All songs are the original work and performance of Ginger Ackley, except for "
The Water Is Wide” and “The Great Silkie” which are traditional songs. The graphics were designed by Ginger, with thanks to her husband, Donovan, for pictures of her actually singing and for the photo of the Ackley Grandfather Clock! The reflection in the glass is her mother-in-law, Anna Mae Ackley. You will also find a picture of Ginger's mother, Mary Jane Brown Achtschin and of her 3rd great grandfather, William Thomas Scott. The photo of the ship is the SS Zeeland, the vessel that brought Ginger's grandparents from Austria to the US in 1905. Ginger used Paint.Net, an open source graphics program, to create all the graphics for "It Is Time." Ginger did all the recording on this CD herself. Having been burned in the past by a pseudo-studio and encouraged by the success of her children's CD, All Earth's Children, she utilized her Dell Inspiron 1520 laptop and Adobe Audition software and produced the songs included on It Is Time. Her autoharp is an Oscar Schmidt body with 24 chord bars modified by Hall Weeks and Pete Daigle. Unlike a regular autoharp, it uses two keys at a time and can make over 100 chords. She plays a collection of pennywhistles on the CD. Some are the Susato brand of PVC plastic. The Low G is one of her favorites for its wonderful mellow tones! Her other whistles were made by Eric the Flutemaker – one of her regular friends out at Renaissance Faires. His whistles are handmade wooden creations that make some of the best music ever. Her favorite mic is a Shure PG58 acquired in a little music shop in Ft. Collins, Colorado. Adobe's Audition software allows her to sing and play all the parts, and to balance them with beautiful effects. She originally acquired Audition for a project to transfer her father's old vinyl recordings to CD to share with family and others... but then she got sidetracked with making her own music! No artist exists in a vaccuum – regardless of how they might feel at times duing the creative process! It Is Time is a product of much support, especially by Ginger's husband of only a year, Donovan Ackley. He made sure she was fed and watered during the times of intense effort – and he even managed to break her away to enjoy friends and other music, like seeing the great folk singer, Judy Collins, in concert. He breathes a sigh of relief as the project comes to an end and his new wife returns to reality!